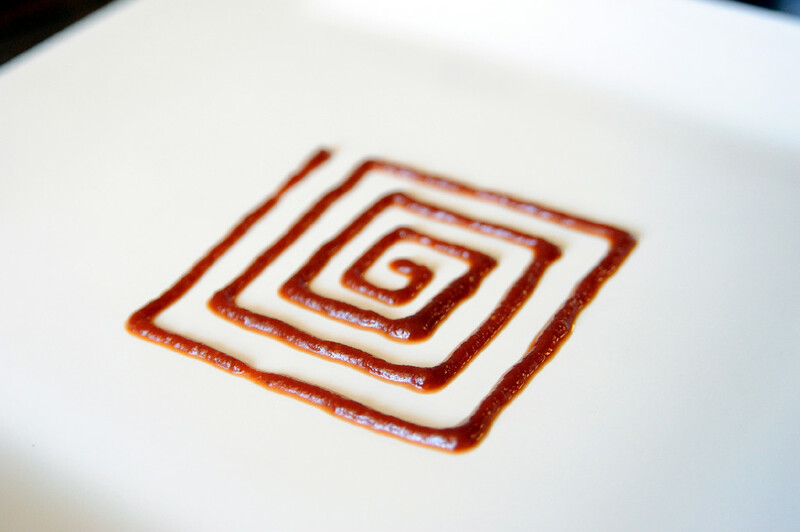 Much like it's friend ketchup, BBQ sauce is a pretty unhealthy condiment. Since kids eat this sauce like it's a side, we went ahead and made a healthy version. For grownups, we like to add some hot sauce and red chili flakes. Your kids may even like a bit of a kick, so go ahead and add some heat. They might surprise you! Baking with kids is one of the best activities in the kitchen. Lots of pouring, measuring and stirring. These muffins are hearty, healthy and sweet. 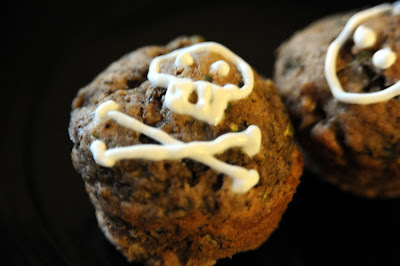 We love piping on cool designs with greek yogurt, like this scull and crossbones for halloween. 1. 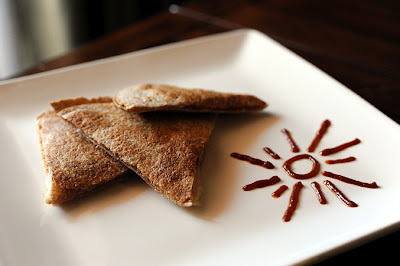 In a large bowl, combine the flours, baking powder, baking soda, salt, cinnamon, and cloves. Set aside. 2. In a separate bowl, mix together the flax seed, agave, oil and vanilla. Add to the dry ingredients, stir just to combine. 3. Mix in the zucchini, banana, and walnuts. Pour evenly six ways into a muffin tin lined with paper cupcake holders. 4. Bake at 325°F for 20-25 minutes. Let cool before eating. Ok, so by now you've realized that we love black beans! And what's not to love? It's super healthy, packed full of protein, vitamins and fiber. Plus it keeps bellies full longer. 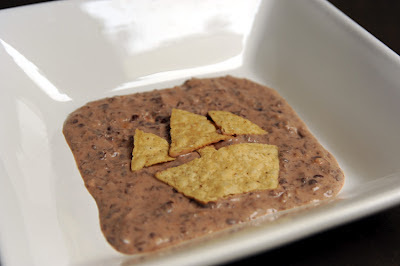 Now we've done black beans and rice, black bean soup, and here's the dip. Kids love dip. Let's face it, dips make life just a little bit better. This dip is really simple and super easy. Encourage your kids to create a design on top with chips. Plating is everything. You eat with your eyes first! 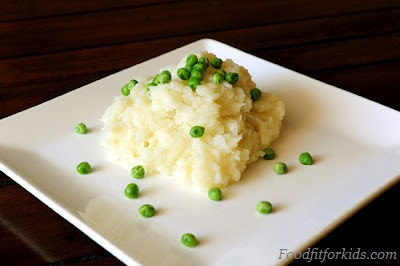 This is a great dish for kids in the kitchen who can help add spices and seasonings. 1. 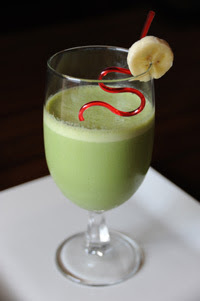 In a small blender or food processor, blend all ingredients until smooth or until desired consistency. This recipe is just delightful. DELIGHTFUL. 1. Because it's fast and simple 2. Because it just tastes awesome. Whether it's tea time or a lunchbox sandwich, this is a winner! Use cookie cutters and have your kids help! 1. Peel and thinly slice cucumbers. 2. 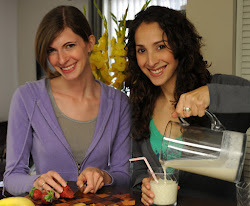 Mix yogurt with seasonings, have the kids help! 3. Spread yogurt on bread, place slices on top add bread and serve. We love a hearty fall soup, don't you? Butternut squash is one of those versatile veggies that bring so much richness to a dish. This soup is perfect for kids, it's packed full of flavor with a thick and creamy consistency. Make your own topping design with toothpicks or squeeze bottles. 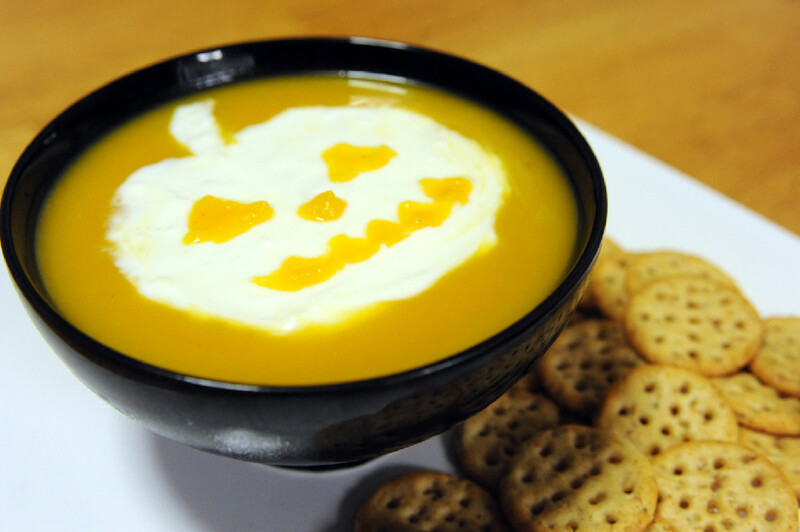 We spooned coconut cream on top of the soup and used a toothpick to fill in the jack-o-lantern with orange eyes, nose and mouth. Pretty spooky, right? Wonder what kind of cool designs your kids come up with-let us know! Try putting this delicious, thick soup in a cute tea cup or other special cup. Maybe even an espresso cup and then fill it up repeatedly. Make a game of the refills, "Please Sir, may I have some more?" "MOOOORE????????" You get the idea. 1. Heat the olive oil in a small pot on medium heat. 2. Add the garlic and brown for 1-2 minutes. 3. Once the garlic is slightly starting to brown add the butternut squash. 4. Stir and gently cook for three to four minutes. 6. Season and cover. Turn the heat down and let simmer until the squash is fork tender (about 15 minutes). 7. Puree in a blender or in the pot with a stick blender until completely smooth. 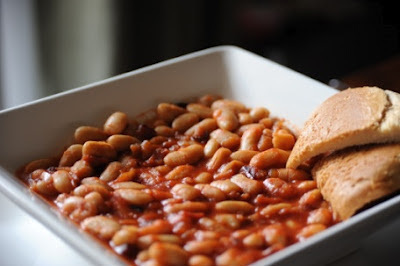 Do your kiddos love baked beans? Canned baked beans are notoriously unhealthy, with loads of sugar and fat, no wonder they taste amazing. This recipe is packed full of flavor, simple to make, and above all, healthy. Beans are packed full of fiber and protein. This is a dish that you will want to make again and again. (Or just make a big 'ol batch and freeze and reheat). Comforting and delicious! 1. In a small saucepan heat the onion until it begins to sweat. 2. Add the orange juice, tomato paste and brown sugar, stir until smooth. 3. Once the mixture is smooth, add the beans. Heat until cooked through and serve. In our house, veggie burgers are a pantry staple. Sometimes you just need to eat something healthy, easy and pre made. Throw together one of these babies with some coconut yogurt spread and your kids will be happily eating away. Little ones will love mixing the yogurt spread together while you slice the cucumbers. 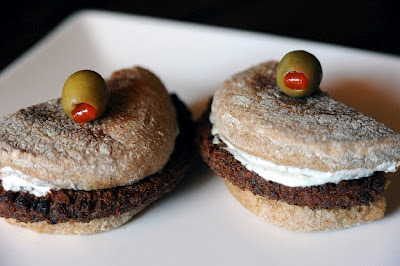 One word on veggie burgers, they are not all made equal. In fact MANY of them are not so good for you. Read the ingredients list carefully. 1. Mix all ingredients together in a small bowl until smooth. Set aside. 1. Toast the English muffin. 2. Meanwhile, bring a small frying pan to medium heat. Pan sauté the burger patty. 3. 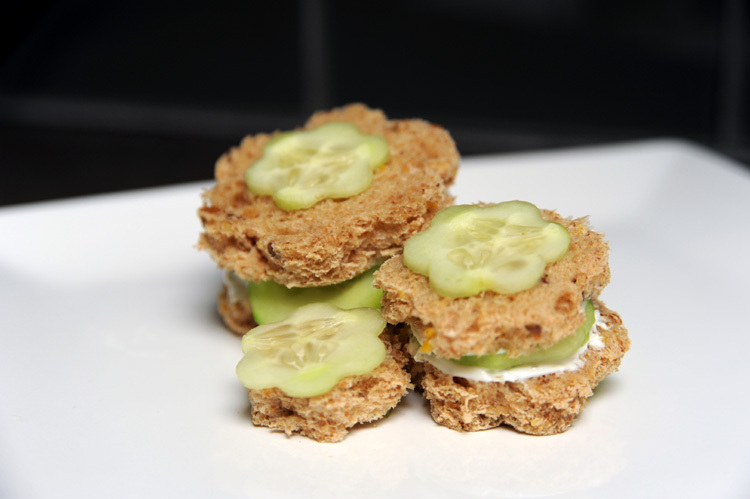 Spread the yogurt mixture onto the English muffin, add the patty and sliced cucumber. Putting a new and delicious twist on an old classic. 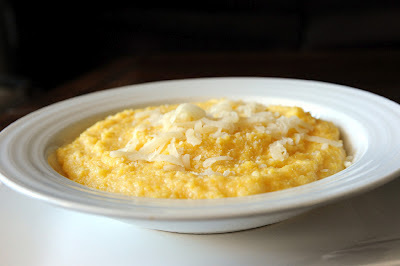 Grits are a great meal for kids, heck, for the whole family! Add some pureed butternut squash and now we're talking. Maybe add a bit of cheeze? Mmmhmmm. Pair with roasted vegetables and you've got dinner made. This also makes for a great breakfast! 2. Slowly stir in the grits and turn the heat down. 3. Cook, stirring continuously for at least 5 minutes. 4. Stir in the cheese, squash, salt and pepper to taste. * Want to make your own puree? It's easy. Cut butternut squash into cubes and put on a pan in a 350°degree oven for 20-30 minutes or until fork tender. Add to a food processor using a tablespoon of water. Add salt and pepper.